I will introduce japanese culture old traditional culture and fashion. Hi, my name is Kurokage Ninja. I was asked to teach how to cook naruto. 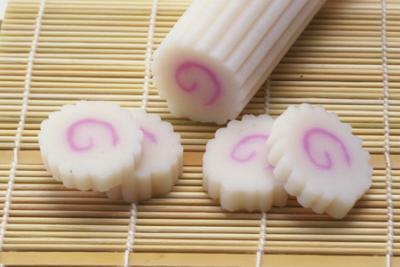 Today, I explain how to cook ‘naruto’. Cooking ingredient is white fish, salt, sweet cooking rice wine(mirin), starch and egg white. Can you buy sweet cooking rice wine(mirin)? 1 Chop white fish, cut fine. 2 Pour chopped white fish into a bowl and add water. Repeat scramble and skimming at least three times. 3 Squeeze out excess moisture, use gauze and etc. 4 Put salt 2g per 100g. 5 Impaste it, make it paste. 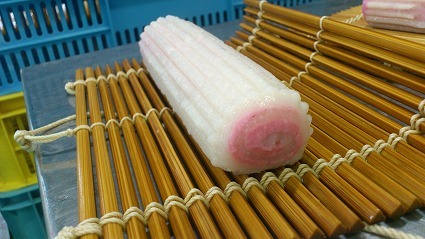 6 Season to taste with salt, sweet cooking rice wine(mirin), starch and egg white. 7 Blend a few drop of red food coloring into a part of mixture. 8 roll out untinctured to form a rectangle, its thickness is about 8 mm. 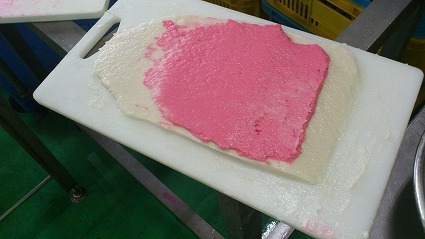 And roll out colored mixture to form a rectangle on it, its thickness is about 2 mm. 9 Roll up it with rolling mat. 10 Steam it, and naruto was ready to eat. naruto is delicious! Let’s cooking.